I’ve had all these pretty pictures of thread on my camera just waiting for me to get a free second to write a post and share them! This thread collection was a collaboration with Aurifil to match my Dixie fabric. These thread kids are available at Fat Quarter Shop in big or smaller thread sets. They are also available for wholesale buyers through your Aurifil rep.
Let me know in your comment if you have any fun summer plans coming up! Our fun summer plan is having NO plan…except maybe a couple weekend trips to the coast and Vancouver, BC. Dixie should be shipping to stores very soon…I’ll let you know when I know! Love those thread colors! Long weekend planned with kids and grandkids at the beach. Since I am new to quilting I would love to try these out! Beautiful! Oh I have too many animals right now so staycation for us lol. I think these will go with my Hazel fabric too. Oh, what a great name to the collection……My name is also Dixie, so i sure would love to win the collection, so I can show everybody the same name as me……. No big plans until the fall. Love those luscious colors of fabric and thread! Gorgeous colors! Planning some fun with my grandson and some work around the house! We own a houseboat at a lake near our house, and our plan is to spend sunny weekends with our friends in the Redneck Yot Club. I love the colors of both your fabric and the threads! Beautiful fabric and thread! We are going to Tennessee to see family. I plan to hold my baby nephew for as long as my sister will allow, and read to the toddler nephew as long as he will allow. At this point, my summer plan is to go with the flow and try to stay cool in the sweltering Alabama heat. We are heading north to the warmth of Queensland to help our Australian winter school holidays feel more like summer! I would be whistling Dixie, if I won this thread set!!!! Such beautiful colors all on one box! Planning to stay busy around home with work and quilting. And a quick weekend trip to Grandma’s. Lovely colors! I’m going to be spending time with my grand boys this summer making memories. Oh, such pretty colors! My summer plans include working on two quilts and a quick trip to Brown County Indiana. Gorgeous color combination! Several long weekend trips here in Texas are on our summer vacation calender. Beautiful colors….and we are spending a month on an island in ME, where we have a year round house. Haven’t done this for quite a few years due to schedules. Such beautiful colors!!! Summer plans include lots of grandkid time, gardening a short trip with my husband, listening to my favorite baseball team, and of course, as much sewing as I can possibly fit in. Beautiful colors! My next summer event is Cousins Camp, six greats and grands here for a week. Lots of fun! Thanks for hosting the giveaway! I’m looking forward to going to the AQS quilt show in Grand Rapids. Otherwise I’m pretty summer traveled out after having gone home for the 4th of July. Beautiful colors! Besides a trip to visit my parents, our family has no set plans. We are headed to the beach later this month. Until then we just hang out and enjoy time with family and friends. Our plans involve a long weekend to see friends in Tennessee, Bible camp for a week, and then absolutely nothing :). I get to spend 3 weeks in MI with my sister. I’m also working on quilts for Christmas presents. I’m sure this sumer will fly by! Love your new fabric line! No big plans, just relaxing:). My plan is the same as yours – No Plan – I prefer spur of the moment activities. Having gone through my thread box this week, I can tell you that I would SURELY APPRECIATE winning this set of GOOD thread ! Thank you for hosting this drawing ! Dixie and her thread remind me of Summers in the South when I was a girl. Our family will be headed to Holden Beach, NC in a few weeks, and I’m looking forward to bathing myself in the ocean and those colors soon. Sew sew pretty. No plan for the Aussie winter holidays. Chilling close to home. Our summer holidays we will go down south to Augusta – we do every year!. Love your new fabric line and it doesn’t get any better than aurafill! We just got back from big cedar on table rock lake in southwest Missouri. We are gearing up for a Few days in Chicago with family before heading to new buffalo Michigan for another low key week on the lake. Can’t wait! Thanks for the chance to win. We have a daughter getting married so we are just going to do a couple short weekend outings. I really love the colors! I’ll be traveling to Wisconsin to the family cabin on a lake for some summer R & R. Of course my sewing machine makes the trip with me. Ooh, delicious thread colors. Beautiful fabric. Had a busy summer last year. Put new siding on our house this year so funds for summer trips is limited. We have no plans to go very far this summer. Love your fabric. My trip is to Seattle! I hope to go to the beach, some picnics and bbq and some sewing. It will be summer here with six of our grandchildren off and on. Picking berries playing cards and quilting in between. Enjoying already. Love the colors of your new line. Enjoying my garden this summer and getting a jump on Christmas sewing! Love those colors! No big plans for the summer as we just recently had a lovely two-week vacation in the Netherlands. Beautiful country! Beautiful thread you have here too! Just got home from a beach weekend here in Sicily – serving overseas in tough ;) Your fabric and thread are very cute! beautiful fabric!! No big plans for the rest of the summer, plenty of quilting time!!! Can understand why you have heart eyes. Beautiful fabric and threads. I have no plans except to stay cool. We have had a busy summer so I’m jealous of your no plans. We are heading to Glacier National Park soon. I’ve never been there before so it should be a fun adventure! I love your Dixie line!! Such pretty colors and fabric!! Our summer plans don’t seem to stop this year. We’re doing a lot of camping in the mountains with family! We’re moving at the end of July, and then spending a week at a lake house with friends in August. Thanks for the chance! We’re going to Illinois for a week for my daughter’s softball tournament…..yay!!!! Good times!!! We like to go salmon fishing on Lake Ontario in August. We are spending lots of time with our granddaughter this month. She loves to sew blocks together so maybe we can actually finish a project! I have lots of tops to quilt so I’d love some Aurafil in your pretty colors! what pretty pictures, such a wonderful sight this chilly winter evening in Melbourne. My summer plans are firstly to get though winter and to whittle down my project list as much as possible. I have a new goddaughter arriving at the start of our summer (December) so I have an extensive list of what to make for her – at the top is a quilt. Can’t wait for Dixie to arrive–I love the bright, cheery colors! I’ve just returned from trips to Hawaii and Europe, so now my summer plans are to stay home and quilt! Love these colors!! We are heading to Alaska on Sunday. Love those colors! My summer starts with a trip to the Rock and Roll Music Hall of Fame in Cleveland, Ohio. A long drive from the Mississippi Delta! My husband and I are looking forward to a NY Yankees vs Cleveland Indians game while there. He graciously stops along the way and back at quilt shops I find on the Row by Row Experience. Needless to say, he’s awesome! We might take a day trip to Shipshewana IN where I might find a quilt shop or two! Two weddings this fall have led to two quilting projects to sew this summer. Both will be scrappy in colors the brides chose. I have no plans for the summet. Wow! Fabulous colors! Leaving next Monday for 2 weeks in the White Mountains and cool weather. such pretty colors that go with so many things, my summer doesn’t have too many trips but probably my 40th class reunion in Wyoming and see my sister who I miss a lot. Gorgeous colors! Summer plans…another camping trip and hanging out at the reservoir? We have no big plans. My high school aged daughter loves her summer job and we’re just going to let her work! I would so love to own these threads!! Unfortunately our summer fun plans were put on hold by a hospital stay for one of my sons. He’s still recovering so we’re hanging at home this summer. Beautiful colors! No big plans for this summer. Just trying to get some ufo’s finished :-) thanks for the giveaway. Fabulous colours! Can’t wait for your fabric to hit the shops! We live in Vancouver, so lots of beach time, it’s very fun! Have a wonderful summer vacation! Beautiful colours! Our family has a couple weeks of camping planned as well as a family reunion, swimming lessons and hockey school. Nothing too exciting! Thanks for this chance. I’m in love with the thread colors and the fabric. Heading to the beach in August to meet up with cousins I haven’t seen in years! What beautiful colors! It makes me think of all the salt water taffy I saw in Atlantic City last week! I’ll be playing in two more golf tournaments, along with quilting of course. Hopefully with some new thread! Love those colors. Sticking close to home with perhaps a couple of day trips. Just back from a week at the coast and preparing for a visit from the grandies! I would love to put these beautiful colors to work soon after. I am hoping to get to the International Quilt Museum in Lincoln, NE in July. I was there several years ago and saw the wonderful exhibit of the Grace Synder quilt collection. It was absolutely amazing! Can’t wait to visit again. We are inching ever so close to retirement and looking forward to a permanent vacation. My fun plans for the summer are to watch our youngest child graduate from BYUI, patiently waiting for Dixie and making Suburbs, and going fishing in the eastern sierras. Oh! Those colors make my heart smile!!! My big plans include a family reunion and an amusement park weekend. Those are some gorgeous thread colours! I’m going on a narrowboat holiday in mid-August with my family. Should be an interesting experience! What beautiful colors! We’re going to have some lazy days around the house and do nothing!!! Those are fantastic colors, so refreshing on a hot summer day. We live in a place people love to vacation, so our summer travel is pretty limited as we enjoy it here. We did just book a long weekend at a favorite B&B that is only about an hour away. Close enough to be convenient, far enough away to not think about the regular ToDo list. Oooh, I’d LOOOOVE a set of these pretty colors!! Our summer plans included Girls Camp prep, Girls Camp, and post-Girls Camp — that was this weekend. Can you tell I’m the Stake Camp Director? 😂 Now I think we’re going to have to make some actual plans! Heart those colors too!!! My plans – spending more time with the Grands. Also some quilt field trips- hope to get to Quilted Strait. No big plans for the summer. Unless you want to count some serious quilt making going on here! Love you fabric line…the colors are so fresh! The thread colors are so refreshing. We are planning a golf trip at the end of July with a group we have enjoyed for ove 40 years. Wonderful Colours!! No plans for summer. Hopefully, I will be sewing. Love the colors! Only plans for the summer is to enjoy it. Winter comes too soon. Awesome colors and I love Aurifil threads! Yummy fabrics and threads. Staycation for us this summer. Staying at home, but went to a patriotic concert last wk, and company coming in Aug. I LOVE these fabrics!! The colors are bright and beautiful and the thread is perfect for them! Can hardly wait for them to be available! Thanks for the giveaway! Such beautiful colors, i would be thrilled to win them. I will spend the month of Aug. at Lake Cowichan, hope the lake still has water in it. I am trying to be practical and use up my older thread collection, but am having more trouble finding matches for today’s fabrics. Would love to try the set. Such lovely colors. Great colors! We had a very busy June so I’m looking forward to laying low in July! We have a few day trips planned but no big holiday. Love your fabric line. Thanks for the chance to win the threads – they’re gorgeous colours. No summer plans until mid-August when we’ll travel from Texas to Michigan to drive with our son back to college. It will be a nice escape from the summer heat and we’ll have a chance to visit with my husband’s family up there! No vacation plans for me this year, other than quilt classes at my LQS!!!!! Grandkids, sailing, and of course quilting! Lovely colors! I have no fun plans this summer. But with 3 weeks off I am sure I can find some trouble to get into. Thanks! My summer plans are moving to Florida and starting a new job. lol Do I know how to live it up during the summer or what?!? I’ve never used Aurifil threads and would love to give these beautiful colors a try! My plan for the summer is to do LOTS of quilting right here at home. We want to go to the Wisconsin State Fair this year. I will be our first time. We live in Illinois, but I’m looking forward to the road trip and FAIR FOOD!!! Our summer fun is happening now. Have had guests off and on since early June. Love having visitors. As a brand new quilter, my summer plans include teaching myself as many techniques as possible and acquiring fabrics and threads. Your Aurifil thread pack would certainly get me off of the white thread I used in my first quilt top! I have just started my second. Can’t wait to see your Dixie fabric at my local shop. I’d love to try that pin cushion. Plus my husband, daughter and I will likely take a quick road trip to Las Vegas (cause it’s nearby and nutty) and to visit friends in Sacramento. Thanks for your aspiring blog. Love these combos! And a huge thank you for your beautiful heart quilt pattern we have all used for the quilts for pulse!!!! Beautiful thread and fabric! Pretty quiet summer so far, just a few quick trips to see grandchildren and family. Soon we’ll have a new puppy that will take all of our attention and energy. It’ll be like having kids again! No big plans here, either. We hope to get in a couple of weekend trips up to Lake Tahoe area. Gorgeous, bright, cheerful colors!! And Aurifil thread rocks my quilty world. This summer the kids and I are spending some time in Ohio with family while my hubs does Army stuff in Europe. Maybe a trip to Edisto Island, SC later in the summer if our schedules work out. The biggest plans I have are to celebrate my grandsons second birthday!!! And a local craft fair!!! I am loving this Dixie collection. And the Aurifil matches perfectly!!! I just set up a new sewing station and can’t wait to get to work- these threads are gorgeous! This Aurifil collection and your Dixie fabric work great together. Love it! Lovely colors!!! I just bought my first spool of aurifil, can’t wait to try it! This line is beautiful! This summer we will be spending as much time poolside as possible to escape the AZ heat! Beautiful colors! Camping, camping and camping are my plans for the summer. Love the threads, beautiful colors. Just got back from our fun summer plans, now it is back to quilting. No plans here either. I LOVE your thread colors and Dixie!! Love the colorful threads! I do so much with gray and white, need some color! My plans are short camping trips in my 13′ Scamp, I like to glamp! Beautiful colors!!! Big summer plans…leaving tomorrow for my first-ever quilty retreat!! Super excited to be going with my best friend and to meet bunch of our IG friends! Your colours and patterns inspire me. Love the combinations. Congrats on the new baby. Love following your quilting adventures! I love your patterns, fabric choices and this thread is gorgeous!!! HELLO, we live near the Rocky Mts.,so we will be exploring them for some summer fun! Thanks for a really neat giveaway! We are going to Maui. The fun part is that I am a teacher and one of my former students will be there at the same time. I had her 11 years ago and now she is off to college in the fall. One of us is getting older, one of us is all grown up. Thanks for the give away chance! This colour combo is so awesome. I think that variegated turquoise is my favourite, though! Congratulations on Dixie! No plans; maybe people will come here. Those are my kind of colors. No plans, we have a new member to the family so our family will be visiting to meet her. :). Hopefully lots of sewing will be happening!! Love those thread colors. They match so perfectly with your fabric. Your colors and patterns are wonderful. All such great inspiration!! So beautiful! I love all these colors. I’m a teacher – so my summer plans are to sew a bit every day! Also, I’m heading to NYC for a few days next week to visit my daughter. Thank you for this lovely giveaway. Spending the summer at the pool, park and zoo! And planning/ making my little lady’s first birthday quilt. Love that fabric and thread! Our plans include downhill mountain biking in whistler! Oh what beautiful colors of threads for all my needs. I love these colors and they will go so well with my stash. Can’t wait to add some Dixie to the mix too! Summer plans include an already taken trip to Disney World with my two-year old granddaughter (so much fun), a wedding in Ohio, and our annual beach week coming up soon. Thanks for the awesome giveaway! A beautiful fabric collection and a stunning set of threads! I love summer and this year we’re visiting Ottawa and Montreal for the first time. We are trading coasts! Love your Dixie line! While I don’t need more projects, I think your line is a must have. Our big Disney trip is over. So, the rest of the summer is trying to make the most of each day!!! In a couple of weeks we are leaving on our Epic Roadtrip 2016; 5000 miles, 7 states, 7 national parks/monuments, family friends, beaches, and an unlimited number of memories made. 😍 love the colors! I need more in my life! We are camping next week at the Oregon Sand Dunes, with my family and friends. There is about 40 of us, camping and ruding quads on the Dunes, it’s our favorite annual trip. Beautiful! We have a summer full of swim team and days spent in the pool! Beautiful colors! Thanks for the giveaway. Gorgeous colors! Can’t wait for your need fabric line. My plans for the summer are to quilt as much as possible!!! I have been commissioned to do a test pattern. I can’t believe they would choose me but the did so I hope I do them proud!!!! This thread would be the icing on the cake!!!!! Thank you for the awesome giveaway! Such pretty colors! We are planning on a camping trip with extended family. Omg! What a lovely box of thread! I’m hoping to carve out time for sewing between fishing trips, family reunions, and the never-ending battle against the weeds in my garden. These colors are so pretty! No plans for us, just lots of sleeping in, lol. Lovely thread! They’ll make a great match for the fabric waiting to become family members’ favorite quilts! (That’s my summer plan…sewing for Christmas! ) Thanks for the colorful give away! Thanks for the giveaway! Love the colors!! We are going to Italy this summer. Heading to a family reunion on a lake in Wisconsin for week. Can’t wait! Congratulations again on your new arrival! Our summer plans are similar…no big plans, but lots of fun mini adventures! Camping, baseball and sewing are our summer plans! I love the colors in your fabric and in the thread collection. I also love that your plan is to have no plans…that used to be my favorite thing about summer vacation when my kids were growing up. Now, I just enjoy that I can sew all day if I want to. I also like to go see the grandkids. Great giveaway! So far my aurifil collection consists mainly of neutrals, so I’d love some colours!!! My plans for the summer is to just enjoy it! Any way I can! These colors are beautiful and wouldn’t they be fun to sew with! We’re expecting a new grand baby in Aug. – best summer plan ever! My plans include going to Florida to put up peas and tomatoes. That thread needs to come down South in Dixie, where I am. Our big plans are going to Spokane a couple of times. Hopefully a lake weekend is in my future! We are headed to the Stampede! If you make it to Vancouver I’d love to give you a fabric shop tour :) Thanks for the chance! I really like these cool-vintage prints! Our plans include small camping trips here and there in our fifth wheel, and then an end of summer trip to Indianapolis with friends. Planning on a fishing trip to Alaska in August! So beautiful!! We are planning a trip to the east coast next month – Maine. Have never been there so should be a blast…with teenagers!! I love the fabric AND the thread – absolutely beautiful! Our summer plans are pretty simple – stay home, do a little work on the house, have lots of bar-b-ques, and relaxing with friends! Just returned from Colonial Williamsburg, VA. The rest of the summer get-away’s will be spontaneous! Your website is slways so attractive, by the way. And I also appreciate the thread give-away opportunity! Love those colors. Our summer plans are just swimming at the pool and relaxing at home. Pretyy, pretty! We’re headed to CA in a week to visit “home”. We are expecting baby #2 in the fall, so my summer plans are to relax and get as much sleep as possible before the baby is born! Love the colors of the matching thread! No plans for me, just work, work, and more work. :P I love the bold colors, such a pretty group of thread! These colors are beautiful!! I’m hoping my summer plans will include a vacation with the hubby, likely to Hawaii. Our plan is also to have no plans! My husband and I both have this week off (although it’s supposed to rain) so we are just going to look out the window in the morning and then decide where we are taking our 2 year old that day. So far it’s been lots of time at the park but we are also hoping for a nice day to go to the lake. This week is also my birthday so we get to spend time with friends. If your coming to Vancouver you should try the newer sea to Sky gondola in Squamish. We haven’t done it yet but it’s on our list. Friends that have done it loved it! Getting ready for girls camp & then relax & enjoy my garden. My family has a camping reunion planned but other than that my summer plans consist of sewing and caring for the vegetable garden. Beautiful thread colors! No real plans for the summer….just keeping up with the yard work and sewing when it’s hot. Thanks so much for the lovely thread giveaway! Such pretty fresh colors! The family will be going up to cool camping in the mountains on a couple of weekends, and my mom and I have two quilting retreats planned! Fun for everyone! Crazy for those colors! I love color!! Hope I win!! Such beautiful colors! What a cheery collection of fabric and threads.😄our summer plans are to relax, sew, read and enjoy the beautiful weather! No big trips planned this year🌞 thank you! Wow, I love the color palette. Lots of local plans, some still emerging. And the local pool. I absolutely love the colors of these threads! I have a lot of fabrics to match them!! I recently retired a few years early so I can go to Reno to help my aging parents who I love more than I can express! I will be going to help them every few weeks!! Enjoy your summer!! What a special treat! Love your collection. I’m new to this craft and have only used white and grey thread. So sad I know! I’d love to use these! Beautiful summer colours! W are packing to leave for a fortnight in the north of Spain! I’ve been getting over a terrible cold, try to keep on keeping on. Lots of sewing to do. I could use more thread, I love aurafil! Beautiful threads! I’m beginning to plan for my son’s first birthday later this month! I can’t believe he’s already going to be a year old! My fun summer plans include finishing lots of quilts for Christmas presents. It’s much easier when the kids want to go outside and play and we don’t have to worry about homework and early bedtime! I love your colors. We are going to Virginia to visit family and eat crabs! All of our kids are coming in two weeks for a beach, boat & barbecue day. That includes nine grandkids age six and under! Can not wait! Planning a summer of sewing…studio space in the basement where it’s nice and cool. I need to get ready for a quilt show this fall. Beautiful colors! Love them. Our family has plans to travel to Utah in the beginning of August to explore Bryce canyon and Zion national park. Can’t wait! My family and I just got back from Universal Orlando, so future fun summer plans for me include catching up on all my Craftsy classes! I’d love to give these a home! My summer is filled up with kid’s sports and studying for my CPA exams. We did get in a fun three day trip to San Antonio, Texas though. Our plans are to start hiking and prepare for the AT next summer. And to finish up some quilting projects. I’m going to the beach in a few weeks. I can’t wait! No summer travelling plans mostly because summer is great right here. Ooh- love the fresh colors and the fabric! Just recently started using Aurufil & is now a favorite sewing notion. We are currently heading back home to MD from a long weekend at the OBX beaches, spending the 4th with family and celebrating a couple of birthdays. Love that Aurifil thread and your sunny and cool colors. I love Dixie and can’t wait for it! I also love the color of the thread. We went in Disney cruise to Alaska and it was beautiful! Now we plan on enjoying being home. Cute fabrics! We are headed to Wisconsin in August for baseball and beer in Milwaukee, Then up north to Door County for cherries and I’m sure I can find a quilt shop or two to stop at. We just returned from camping! My kids are excited to swim the rest of summer! We’re taking a big family trip at the end of the month to the big island (Hawaii) before we move back to the mainland (Mississippi) in September. Wonderful summer colors. Thanks for the chance to win. Our family vacation was spent at the beach. Now we just swim and relax the rest of summer! Hoping here on Amelia Island you would come visit us (and bring that beautiful thread). You could stay at the Ritz Carlton and if you’d like, we could see in my studio. I would make sangria, shrimp ragout, and bread pudding. Your Dixie fabric line looks beautiful, and it would fun to have that lovely collection of thread to go with it! Our summer plans include spending lots of time exploring our Colorado mountains. big summer plans: two week Baltic cruise, #2 son getting married on the West coast, flying back for an East coast reception a week later for all those who couldn’t make the trip ~ I’ll be ready to quilt after all that!! Oh, fun! Such happy colors! We’ve already executed our Big Summer Plans: A camping trip in the Sequoias. It was perfect! No plans yet, but hope to take a weekend in the mountains for our anniversary. Love the colors! We just have a quick trip to visit with family planned this summer. Wow. What a treasure. Just started using Aurifil and there’s no going back now! Hoping to do more sewing and less running the rest of the summer! Summer will center on daughter’s wedding in August. Plans: of course quilting, tending my huge garden and a trip to WY by the Big Horns! Beautiful thread colors.We will spend a week in Chelan and of course I will be taking my machine with me. Love following you. Such dreamy colors to match your beautiful fabric! We are heading to Utah to help with a new grandbaby soon! We are planning on a few days trips with our two dogs. They are a hoot! Oh my goodness those fabrics and threads are gorgeous!!! Nice work!!! I love the small scale prints! My family and I are headed to Battle Lake, MN for a week at the end of the month, and then I am taking my oldest son (who will be 15 August 13) to Florida on a plane and everything in August. It will be his first time out of the Midwest and on a plane! We are so excited!!! Love the fabric and thread! My plans are to visit family and friends. Amazing colors and prints in the Dixie fabric. We are heading to the beach for vacation. No huge plans this summer… my boyfriend has some family visiting from England in August, that will be the most exciting event! Other than that, planning a day or two to go to the beach and relax. A wonderful giveaway. Aurifil colors are so pretty and sew good too. Only summer trip is to attend my granddaughter’s Bible Quizzing National Finals. Her team won first place in the Texas district and now onward to the national finals. Her aunt made the most profound statement I’ve heard in a while. A minute in God’s Word is a minute in the very presence of God! Can’t get better than that! Ooooh!!! <3<3<3<3<3 Your collection! and the thread with it! what a giveaway … that would make my summer so happy! Greece next week, what could be better?! Such a lovely rainbow! Looking forward to a week on the lake with the kids/grands! The colors! Dixie looks adorable! I just love these colors! Thanks for such a nice giveaway! Love the thread colors and love the summer plan being a no-plan. Sounds super simple and spontaneous. Thanks for the chance to win. Hazel looks so great! I just got back from our epic summer trip (8000+ miles! ), so my plan for the rest of the summer is to laze around as much as my seven kids let me! Just completed our major summer trip, which included a visit to the Mendocino coast area of California (ahhhh), and a quick jaunt up to southern Oregon to visit family. Thanks for the giveaway! Woo Woo! Those threads are gorgeous! We had a wonderful weekend filled with roadtrips and parks. We’ve already had our summer fun–a trip to the SF Bay Area. Great colors and the fabric looks gorgeous! Our summer plans are to visit our daughter, son-in-law, and granddaughter, as well as some other family. And to keep plugging away at some house projects. The colors are amazing!! Traveling the Oregon coast in our RV. No travel plans as yet because we are expecting a new Grandbaby at the end of August but will probably head to Florida or Alabama towards the end of the year. I’m also very excited to be getting my very own ‘New Baby’ – a Bernina 770 – sqeeeeeeeel ! Love this collection of fabric and threads. We are heading to Arizona and California – it will be hot and dry, just how I like it. Such a gorgeous set of thread. No big plans, for we’re building our bew house! Oh, and our summer plans are a trip to Costa Rica. Can’t wait! Our “summer” vacation doesn’t actually happen until public school starts back in the fall. We wait to go to the beach after everyone is in school! Gorgeous! I’m saving my fun for fall, when I get to spend hours and hours in classes with Angela Walters. Gorgeous!!! You can never have too much thread, right?!?! Such lovely colors! My summer plans mostly involve babysitting grandkids and some nice drives. We usually travel in the Fall, when all the children are in school. Our daughter is moving this summer, so that will be our travel time!!! Love your colors and threads! Summer plans include a week at the county fair (my daughter will be showing turkeys, ducks and a feeder calf!). Hopefully, some camping and canoeing to follow that! Love Aurifil thread and those colors are gorgeous. I love the colors! We have no real plans besides relaxing and playing. What sweet and cool colors! We already did our big summer plan. Went exploring along the middle Mississippi River on the Great River Road. Wonderful trip–I recommend it! Gorgeous! My summer plans are to finish some quilts!!! We’re going to PA to see our son later this summer. Beautiful threads and I love your fabric collection “Dixie”, especially the large floral – swoon! We have a farm so unfortunately we don’t really get to do vacations. I am a homebody anyway :)! Thanks for the chance to win! My fun summer plans include a trip to Seattle, leaving in one week. Hopefully while I am there I will get to meet a new grand baby due on the 14th. Thank you for a lovely giveaway. Lovely threadcolors! Righ now I am looking forward to meeting up with some former collegues and friends, when we’re all free! I have missed them!!! Love the fun aurifil colors. I would love to try them. Oh, how exciting! Love those fresh colors. And love to sew with Aurifil threads. Thanks for the chance to win. My summer plans are sewing and spending time with my grandson. Love the colors. I have two sewing lessons planned in Amish country next month that I am anixiously awaiting. Love Aurifil thread and these colors. Just returned from a trip to Hamilton, Missouri. These fabric and thread colors are gorgeous!! So happy!! I would love to win them and thank you for the opportunity!!! A little family reunion at my daughters in Wichita, KS are part of our summer plans. I love your new fabric line and this thread! Though it’s winter here in Sydney (and it’s actually not too cold), Summer is the season I love the most…gardening, going to the beach, eating watermelon…your beautiful thread pack really takes me there now…incredible! Enjoyed reading all the comments. Travel, relaxing and sewing seems to be the theme. We took a trip of a lifetime for us last year to the Grand Canyon ….we live on the east coast. So this year going to enjoy some day trips with our 2 year old grandson and seeing for our fall craft fairs. Those threads would be greatly appreciated and enjoyed. Lovely colours. Summer walks in the Yorkshire dales is the plan! Whoa! Beautiful thread! Now that I’m quilting every weekend and most evenings, I sure am using a lot of that stuff! :) Here’s hoping for many more hours of sewing indoors, out of the Georgia heat, this summer. Thanks for the chance! No big plans…just enjoying small trips when the weather and inclination cooperate. Love this thread collection and looking forward to Dixie! Your household must have had an exciting evening! Learning to quilt and my first top is almost sewn as I write, now I’ve got to try and quilt it eek!! 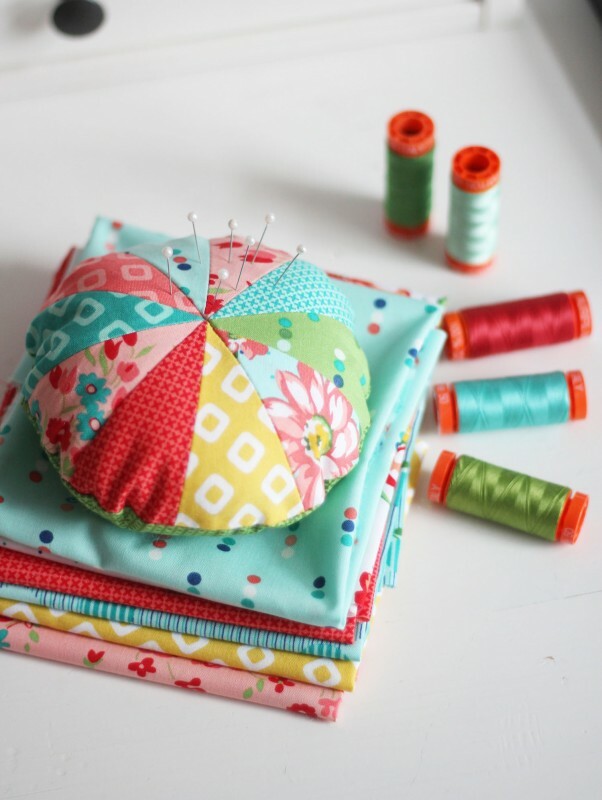 I’ve booked a sewing course in the summer break – some me time! Then family time in Cornwall, UK, on the coast, it’s beautiful. So enjoy your blog, I’ve been a ‘lurker’ for a while and learned so much, thank you. 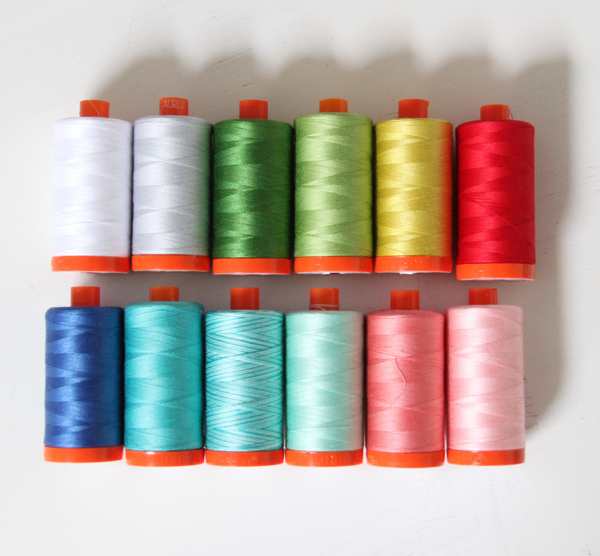 Love your thread colours, luminous, match your fabrics beautifully. Best wishes. I love these colors! We are going for a short camping trip next week, but mostly having no plans is our plan as well. Wow! I love the colours and the fabric. I cant wait until it comes out. Plans include moving college children around, and some beautiful sunset boat cruises. Very pretty colors and I only use Aurifil. I’m looking forward to an intensive 4 day long arm class put on by Handi Quilter next week. Can’t wait to learn some new tricks! Beautiful threads to match a beautiful fabric range! It’s winter here so my plan is to keep warm & do more sewing. No big plans, but we do go to the lake on weekends. We aren’t going anywhere. My sister is bringing mom down for a week. We will all have fun crafting. I can only dream of Summer here in Australia. Great colours to cheer up a grey, rainy day! Friday is my birthday, so I would love to win!! :) We don’t really have any plans for the Summer, but our Fall schedule is filling up fast with travel plans! Horray for family get togethers! Love your fabric colors with the threads! Summer plans? Live life and enjoy even if I’m at work! My “fun” summer plans are to build a shelter for my old mare and mini horse from pallets so they can be out of the cold this winter. I am saving up the pallets for it right now. I have 24 pallets and need probably around 50! I know that has nothing to do with sewing or thread at all, but my further plan is to relax after a day of building, with an evening of sewing! Thanks for the opportunity to win some pretty eye candy! The fabrics and threads are so nice. Thanks for the giveaway of the threads. I have no summer plans. I am just staying home and relaxing. 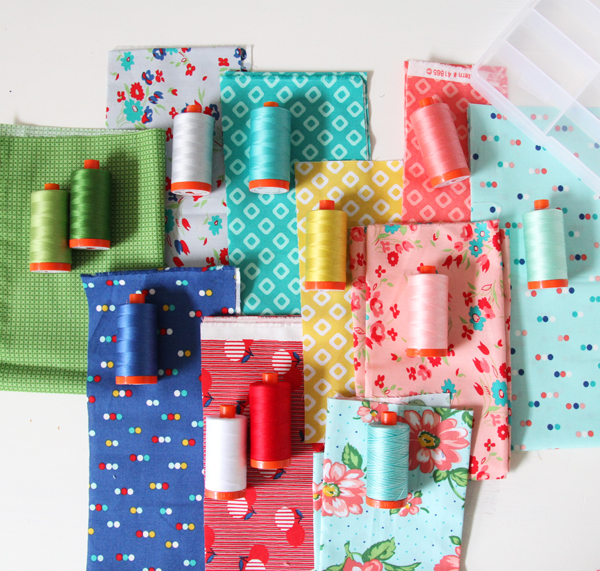 I really like your Dixie fabric and am practically drooling over the bundle paired with yummy Aurifil threads! Later this summer I’m going to WA state to visit my son & his family-YAY! Just before Labor Day, we’ll be going to Lake Tahoe to visit with my step-son & his family. In the interim, I hope & pray I can finish 2 quilt I started l-a-s-t year! Beautiful colors! We are heading to Florida at the end of the week. I’d love to try a giveaway win :-) Our next big thing is a visit from my husband’s brother–“Uncle Doug” is coming to see my 2 year old son for the first time since he was 6 weeks old. Love, love Dixie! Summer already underway taking 3 grandkids camping in state parks. They each carry along a camping quilt where we sew patches from all the places we’ve been. Fun, fun! My husband is leaving for three days and I’m going to sew while he is gone! Love the colours. I have no summer plans right now as its winter where I live. But if it was summer my plans would definitely include the local swimming pool. Refreshing and vibrant, they are cuddle up comfortable colors that go well together. Looking forward to your fabric collection! Those beautiful colors in my favorite thread would put a smile on my face for sure! I’m pet sitting for a week and then off to visit friends in August. Gorgeous colors! I’ve been to the beach already, so no plans for the rest of the summer. No real vacation trip planned but a short trip to NC mountains and Georgia beach. My favorite trip will be to see my brand new grandson. Love the colors in your new fabric collection!! Gorgeous colors that would work oh so nicely with my row by row. Just got home from a girls trip to Seattle, and are planning a trip to California followed by a beach trip to Florida. Love your blog! Gorgeous fabrics and beautiful colours! I don’t have summer plans yet, but am going to Ontario in September for a family wedding. I’m not too far from Vancouver, so I could take personal delivery if I win ;o) – ha-ha! Beautiful fabrics and beautiful thread. I haven’t quilted in over 30 years. Just starting to get back into it. Amazed at all the new products available. Can’t wait to get going again. Only vacation we have planned is a trip to Crater Lake. Beautiful colours! Shall be visiting Vancouver BC as well! Beautiful colors! No particular summer plans, just to enjoy time with family. We are a tuslly on vacation at the beach right now! Thanks for a chance to win! Thanks for the opportunity. Our one exciting summer plan is to spend a week in a small cabin at a large lake in New Hampshire, where we can spend most of our days playing on a quiet sandy beach and listening to loons call. I have just started using aurifill threads and love them. These colours are gorgeous. Would love to win them :-). It’s winter school holidays here in Australia so we are busy crafting and sewing and rugging up for trips to the beach for fresh air. Thank you for your generous giveaway. Beautiful colors! Enjoying the longer days and some golfing. Thanks for the giveaway. Heading to Cape Cod this weekend — with some stitching of course! Love the thread – would die to have it! Going to the beautiful Georgia Coast – St Simons Island in the next few days. Planning to go to one of our (Oklahoma) state parks before my oldest leaves for college. Heading to the “little” cottage with our three boys in beautiful Tiverton Ontario … Love Lake Huron. Beautiful thread what a great inspiration to do even more projects. Easy plans, camping trips to the mountains locally and maybe a trip in the fall to visit family. Of course we will include our 14 month old grandson, what a gift he has been to our family. Thanks for the opportunity to win! So beautiful – the thread AND the fabric! Headed to NY for family reunion soon. Then later this summer seeing friends in Rehoboth, DE, Norfolk, VA, Chapel Hill, NC and Charleston, SC on our way to Hilton Head. Moving end of summer so we are able to travel in transit!! No more plans – we just used up all our summer vacation fun with a weekend at the beach! Wait a second, Aurifil has variegated colors? How did I not know this? No immediate summer plans, as I start a new job next week. I am spending a week in Napa in November after running a relay race, and am really looking forward to it. Beautiful thread! Hopefully our summer will include lots of relaxation. We’re going to Disney World in the fall so no big plans for the summer. Our big summer plans include going to the beach in August and trying not to melt! Love the colors in Dixie! 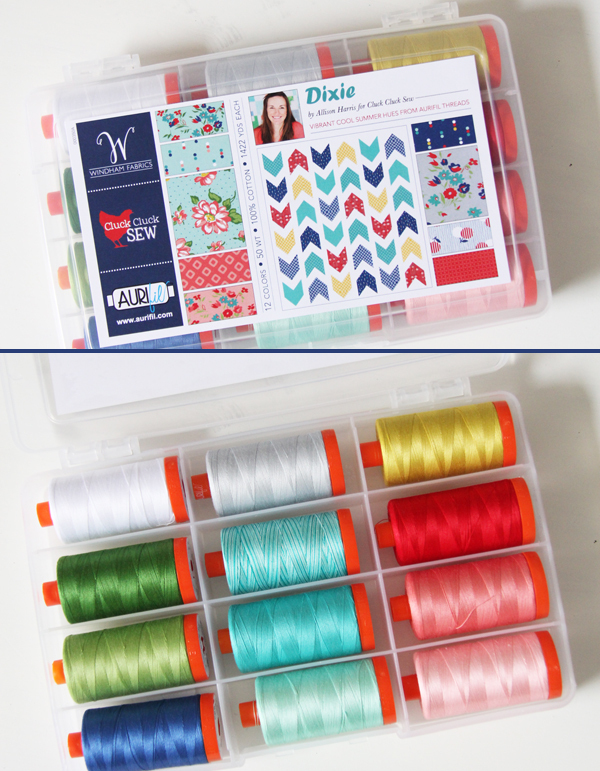 Can’t wait until Dixie comes out – love your fabrics and the thread collection too. No big summer plans means more sewing time! Thanks so much for the chance to win some lovely things! I ❤️ the colours in your collection. So cheerful! Congratulations! What fun colors! I’m keeping the summer plans low key and looking forward to Quiltcon East next year! Such pretty colors! A trip to the beach and lots of pool time is all we have planned this summer. Beautiful colors! I’m ready to branch out from basic white, beige, and grey! Just gorgeous! Truly an inspiration sew with those lovely colors. I am also looking forward to no plans for this summer, except for a short trip to visit friends. Beautiful threads!! We just moved to a new house so we are having everyone come to see us this summer!!! Love these colors! Our plan this summer is taking a hot spring trip and trying camping trips for the first time in Japan, where we moved back from sunny California a year and a half ago. Our plan this summer is like yours. We have no plans just random fun! Love these threads and would love to quilt with them. Thank you! We have no plans for the summer as my husband works all summer, but we relatives from CA coming to us. After they leave, I will lots more time for sewing and the colors in the collection would be great inspiration for some projects. My husband took a vacation week so we plan on having fun. We have lived in San Antonio 3 years now and haven’t really gotten out so we are staying home and visiting around town! This thread looks amazing. Love the colors. No big plans for our summer. Maybe a day trip here or their. Seems like we have more fun on little unexpected trips than if we plan a big elaborate trip. Thanks for the great giveaway. Love these colors. The Dixie line would go well with my Hazel fabric. Only summer plans are to get out in my new kayak. these are gorgeous! I would be counting myself lucky to win such a collection of yum! This summer our children used their 2 years saved newspaper route money to buy themselves an above ground pool! It has been all that and a bag of chips, I tell ya’! They are wet more often than dry–such fun! Love these colors!!! I’m new to quilting but am quickly building a thread and fabric collection for all the projects I want to do…so these would be a lovely addition! No major plans for the summer because things are about to get very busy at work. Your Dixie fabrics are gorgeous, and the Aurifil threads match perfectly! No big plans this year; we have two houses, one is for sale — so no extra $ this summer. Planning some fun day trips close to home though — like you. I love these colours, I smile every time I see them. We’ve just bought a house and hubby is starting a new job so no big plans here. We will be at our local beaches and parks a lot I’m sure. Summer plans include lots of sewing. It soothes my soul! I’m taking a week off work but so far no plans. Which is my favorite kind of vacation! 😄 Your new line looks amazing! I can’t wait to get my hands on it. Such pretty colors! Looking forward to getting some pieces of your new line. I am headed out for a week to spend some time with family. No other plans at the moment. We just got back from a trip to the Washington coast to see friends over the 4th. Might see how many things on our bucket list for Idaho places to visit we can cross off! Canadian East Coast! Road trip! I have never tried Aurifil. Would love to try. Thank you for a chance. The thread colors are perfect with the fabric!! Gorgeous actually ! My plans fir the summer…I think it will include lots of quilting with this beautiful thread that I hope to win!!! No big plans. My husband farms as well as another job so summers are busy! Hope to get to the beach though! Lots of sewing while my boys play! What a wonderful giveaway! I’m in love with your fabrics and now the threads are yummy! Love your fabric and thread! Getting organized for a future move. Love these beautiful thread colors! Thanks for the chance to win the set! Heck! what could be funner than the 4th of July spent in ASHTON!??? yesterday! :) oh wait…winning these lovely colors! yes. they are all lovely, I would very much love to win them…..our plans are vacationing at my hometown and summerhouse. that is enough for me…. I think the colors would be perfect to make your Nautical quilt with! No vacation, just a lazy summer. Love thread in a box! It’s the middle of winter here in Perth, Western Australia. Perfect time for making snuggly quilts! Love Aurifil thread and the colors you have put together. i may have to get a few of the pieces from your new line of fabric, also love your patterns. Beautiful thread colors! No big plans this summer. Hoping to fit in more sewing and more time with grandsons. Love the gorgeous colors. You will love Vancouver. Lovely, lovely colors! Our fun summer includes trying to get out and hike as much as possible! Hi, both thread and fabric are really beautiful. I’m quite new to quilting so I would like to build my stash. Plans for the Summer? I do not really know already if the sun comes to us in Germany maybe I will enjoy a day at the beach anywhere otherwise I will enjoy that I don’t have to do anything. And of course I will sew. Congrats on the new collection and the collaboration! They are vibrant and refreshin. I’m super excited about getting my laminate floors installed next month… AND I’m making plans to go to my first Quiltcon in February! Pick me, pick me, pick me…Hahaha. Thanks for the chance to win! Planning to play in the sprinklers, play tag, read in the grass, eat lots of snacks, and eat berries! Summertime! We are taking a trip to Seattle Washington. Beautiful colors! Just hanging around the house trying yo stay cool! Love , Dixie….I am out in the garden trying to recreate the wonderful colours with flowers. I love the new colors in Dixie! I’m always drawn to bright colors, and Dixie is no exception. I’m not doing much this summer except trying to stay cool (as electricity rates go up here in San Diego), like so many others. Beautiful match! Can’t wait for your fabric to be available! Such yummy fabrics and delicious threads. It is winter here in Aus but the sun is shining. No plans to do anything except enjoy being at home. I love the pretty colors! We are camping this summer at the beach! Our family camps with other families. It’s a great bonding time and it creates great memories for our kids! We are lucky enough to be spending 2 weeks in Hawaii= can’t wait! My sister was just saying that she wanted these for her birthday next week!!! My summer plans include having a baby…yay!! Who wouldn’t love those beautiful colors! Count me in! Love the beautiful colors. They just make me want to start sewing. But I need to finish my current projects that are staring at me. I am in the middle of making stockings for the family. Summer plans…staying cool and inside in this crazy Arizona hot summer. Looking forward to camping trips up north where the kids can actually play all day outside and not get heat stroke!! I have no plans for the summer, except to do as much quilting as I can. The threads and Dixie are both beautiful! I’m going to the juggling festival in El Paso with my daughter. She will juggle; I will quilt, crochet, and read! Your thread colors are gorgeous! I’m a few weeks behind you, Allison – we just had our baby #4 – our first boy, though! Our summer plan is just staying home with him until we venture back home to Olympia to visit family & friends in August. Cheers to a baby-filled summer! I’m going to visit my family in Denmark for almost four weeks in August. I immigrated from there when I was nineteen, 39 years ago, leaving my birth-family behind. I’m very fortunate that I get to visit them almost every summer. As I always do, I’ll be bringing a major hand-piecing project, and I usually get a lot done. No plans to go away but planning to have one of my grands come spend a wk with of us doing lots of cooking & baking together & enjoying our horses,cows & dogs. The thread collection is as pretty as your fabric collections! Thank you for the opportunity to win the thread collection! First I have to say the threads colors are scrumptious!! Just love them all. As for summer plans, we hope to head tonorthern New Mexico to escape some of the heat and see parts we have been too…hopefully Taos for a few days. Enjoy the summer fun! I just love the things you create. My hopeful fun plans are to find some time to do some quilting! I love the colors in your fabric line, Dixie. I will be sure to watch for it in our local quilt shops. The Aurifil thread colors match perfectly and are so pretty. Love using Aurifil for my piecing and quilting. No “fun” plans for this summer. We are getting our house in Cleveland ready to sell. After my husband retired and we moved to a new house, our oIdest daughter, Kim, lived there until she passed away. It’s a lot of work – painting, pulling up carpet, replacing the old carpet in the family room with a floating wood floor, updating light fixtures, etc., etc…… We are getting help from family members, for which we are very thankful. Enjoy your summer. Portland, OR is our destination, love that part of the country. And some quilting will get done, also. Those colors are delectable! I will look for Dixie as those fabrics make me want to make little quilts for friends to share their vibrant colors. They remind me of summers spent lying on the grass staring up at the clouds, swimming in the creek, and eating outside at the picnic table. This summer I want to find a new job! I will find some time to sew, too. Thanks! Hi love your stuff and would love the thread. Such pretty colors. My plans is going to lake Havasu to play on the seadoo and paddle board. Love the colors in this collection !!! Our youngest son is getting married this summer , and hopefully a little traveling !! That should take care of our summer !! Wonderful collection & colours, I would be happy to win. Beautiful colors. I want to become more adventurous in thread colors while machine quilting This kit would be alot of help to start achieving this goal. New England States so beaitiful. This summer I am finishing the alterations on bridesmaids gowns for our son’s wedding. He and his fiancé will be married in August. This will make five of our children married, one more to go! Then I will begin making baby quilts, as we have three grand babies due to arrive in the next seven months! Life is good! Your fabrics are beautiful. Beautiful. Our summer plans include having our 13 year old granddaughter fly out to visit for 3 weeks. Haven’t seen her in a year. Summer is a long way away here in oz, cold dreary days here in Melbourne Victoria Australia.Great however for sewing and snuggling up under quilts while you sew binding on. We do plan to take a week in August in North Queensland where you can still swim in winter and have a weekend exploring the city I currently call home. We left California on June 24th pulling our boat across Nevada, Arizona, and New Mexico, to Texas. I wrote all about our trip on Facebook, but did not begin till 2 days after leaving. We sure surprised our daughter and grandchildren! I even recorded a video of the door opening and my daughter crying!! We are staying for two birthdays and will then drive back to CA, but without the boat. We are having fun but we don’t like the humidity here is n Texas. Love your threads! Beautiful colours so vibrant. My only plan is to sew more. Lovely colours and a perfect match for your beautiful fabric. Apart from going to Sweden this summer to see two of our beautiful grandchildren, I shall be making 2 baby quilts for my niece and her husband and nephew and his partner, both of whom are having babies in the Autumn. One is a much waited for IVF baby. My sister is over the moon and as she can’t sew anymore because of severe arthritis, I am only too pleased to have the opportunity to make more quilts! Have a good summer everybody. Jane, Edinburgh, UK. I love the bright, cheerful colors of your line! We’re heading to Cali to the beach. Then I have a Row by Row Experience quilt to begin/finish. I am having a hard time trying to figure out a color scheme in making the rows have a cohesive look. Have you ever made one of these quilts before? If so, I would gladly welcome any tips. Happy Wed! Such beautiful fabric and thread, Alison. Thanks for the give away! Love the colours in your Dixie line & the matching Aurifil threads are just darling! I live in Australia & am in the middle of a (relatively) cold winter, so I’m currently dreaming of warmer weather & summer adventures later in the year. Thanks for the lovely giveaway! I love your colors! We are leaving in the morning for a 3 week RV trip through northern California, Oregon & Washington. Yummy colors! I love the name of your new fabric line since I am from the Heart of Dixie…Alabama! Our grandchildren visited us last month. We had fun at the beach, neighborhood fishing and our annual bowling tournament. Working on home renovations during July. Not sure about August! Everyone is coming to our house this summer–and we have a new puppy! So, how’s that for fun? Beautiful threads. Colors are gorgeous and match the fabrics so well. Oh! I CAN’T WAIT to get my grubby little mitts on Dixie!!! Aurifil matches perfectly! My plans for the rest of summer are for a trip to Oregon, and a long weekend at Lake Tahoe!!! Beautiful color combination, thanks for the chance to win this generous offering. I have promised to devote this summer into finishing All my Christmas wall hanging and various Christmas themed quilts. We will go to Adriatic sea. Can’t wait. And I can’t wait this blue fabric with dots, because I am looking forward blues for 8y boy. It is hard to find prints. This summer, we are integrating 2 coops worth of chickens into 1 happy chicken family! Thanks for the giveaway! Good luck everyone! Wonderful threads to match beautiful fabric. We plan a trip to the ocean to escape the heat of the valley! I’ve finished piecing my beautiful Tahoe quilt, and my summer-time plan is to quilt it. Can’t wait to get started!!! Love the Aurafil threads and Dixie! I would love to say my summer plans were not to do anything but I have 5 weeks of summer before I got back on ship and 3 of those I am away sailing. I need to try and finish the cardigan im knitting during that time. Love the fabric! 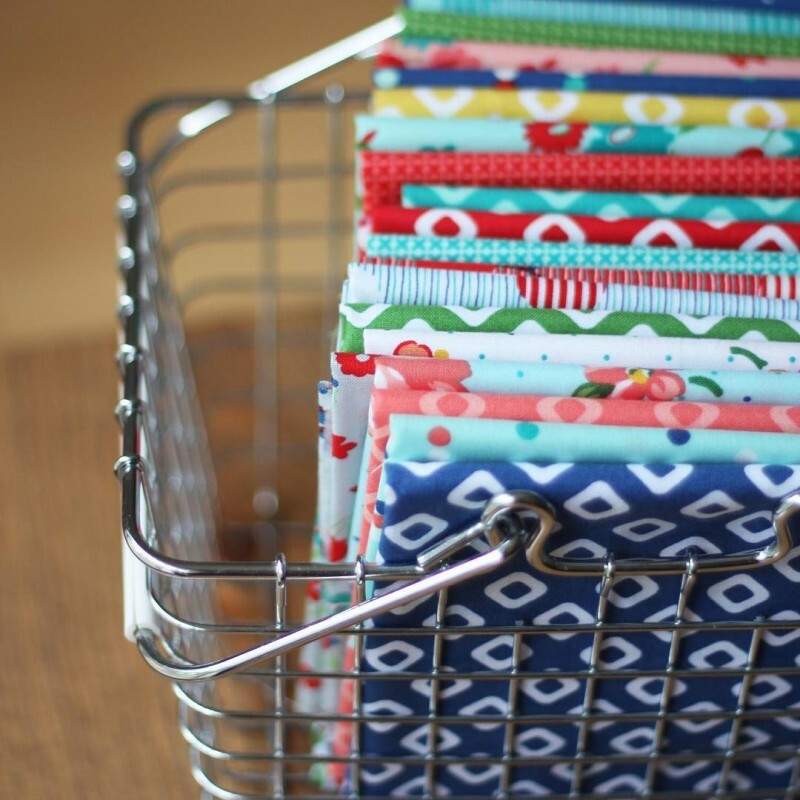 – I’d love to make a bunch of fabric trays with Dixie for my sewing room. This summer I plan to finish a quilt – including the dreaded machine quilting! Very pretty fabrics and threads. My summer plans are going to New Orleans to see my grand babies. Thanks for a chance to win. Beautiful colors! Planning on sewing for hours and hours at the cabin in the woods. Beautiful fabric. We “vacation” by visiting our children. We have two old and sick cats, so are staying home this summer. Thanks for the giveaway! Love the colors! My vacation plans is to win this giveaway. ahahaha just kidding! We have a couple of beach trips coming up—one is my husband’s work conference, the other is just fun. Really looking forward to these as we’ve had a really busy spring/early summer prepping for a wedding in our sunflower field. I love Dixie—reminds me a bit of Hazel and looks like they will go nicely together. I have a good bit of Hazel….need to get some Dixie to mix in!! Summer plans include moving the family to Guam to follow my military hubby. Praying my sewing machine and quilting gear survive the two month journey via boat! Love the colors in the Dixie line! we have bought each other bikes and plan on getting out more with them. Also some picnics on my new picnic quilt! We are spending a few days on a lake in Vermont with friends. Love the colors and Dixie fabrics! Summer started early for me. We have vacationed for a week in June with my Albuquerque DD, SIL and DGC in the Colorado mountains. We returned home to Massachusetts only to pack up and then do a road trip to Alabama to visit DSand DIL. At the end on the week we meander toward home stopping to visit DD and SIL in New Jersey. I can’t wait to get back to my sewing room! Those colors are absolutely beautiful. Beautiful colors. I am planning day trips to local area quilt shops for row by row kits with my 84 year old mom. We both managed to finish a row by row last year and win a group of fat quarters. Beautiful colors. Can’t wait for Dixie. We’re going to San Diego next month for a family get together. Yummy colors! House projects going on so just a few day trips with grandchildren this summer! I hope to visit a few quilt shops! Hope that Dixie will be coming to the UK soon as well. As for summer plans, here in the UK……well buying yet another umbrella for the never ending rain.lol. We too have NO Plan for this summer – so that means I can sew more :)! Enjoy your weekend holidays – they are often the best! Summer mornings in SW FL are so tropically delicious! I love getting out to hear all the birds singing, smelling the sweet morning scents and going for a quick walk. I get a lot of inspiration then. Wow, great match of the Aurifil to your fabric line! Love the colors and your fabric is SO fun! Thanks for the opportunity to win this great package. I’ll have my fingers crossed. Those colors are gorgeous! I am using aurifil thread on my current quilt. Love the smoothness of it….no plans for the summer…just relaxing and plenty of time for quilting. Thank you. These colors are so cheerful. They would go with every color I ever quilt. Congratulations on your beautiful Dixie line. No plans but I have a very large tote of quilt tops just begging to be made quilts so I’m gonna listen to their call an getrdun! Can’t wait to start on more! Lol! Beautiful shades! Especially that aqua variegated one. Love Aurifil thread your new Dixie line as well. Not much planned here either. Going to Florida for a surprise 60th birthday celebration and then going to the Country Living Fair in Ohio for a long weekend. Love that and always find too much to buy there. Happy summer! Those colors are the best and, somehow, I don’t have one of them so would love to win this!!! We have just returned from a week at the beach (or soundside in our case) and look forward to going again at the end of season. In the meantime, I plan to sew (QAL’s, samplers, a bit of collage, pouches) and sew and sew- well, you get it! Thanks for the chance. I love the colors. I collect Aurifil and use it almost exclusively in my projects. My next vacation will be beachside in October. Can. Not. Wait. The aurifil thread colors are prettier than a rainbow!!! I need to make an “I SPY” quilt for a precious little great-niece and great nephew to share! Can’t wait to get started before summer is OVER!! Thank you for the opportunity to maybe win! I would love these threads! Love these colors and fabrics! Will certainly add cheer to any day! I love your new fabrics! Cannot wait to hear where I can find them! Love the thread! No big vacation plans. A once a year trip with girlfriends to the Chicago area for s stitch retreat which also includes shop til you drop at quilting and cross stitch stores. We are from Ohio, Indiana, Arizona and Illinois. Two weeks away! Love all the aqua colors in this thread set, my favorite color. Such pretty colors. I want them all, fabrics too! Other than trying to catch up on yard work, we plan to drive up to Quebec for our 30th anniversary after the start of school. Oh these are just so yummy! Our big summer plans are a trip to Southern California for a week in July!!! They do remind me of Saltwater Taffy, too. Such vibrant, beautiful colors and they compliment he fabrics so well. No major summer plans, more sewing and making lists of sewing fabrics and thread I want to get (hint, hint ;-) Thanks for sharing with us. Ah…I have tons of fabric but not so much thread and this would be such a welcome addition to my ongoing quilt-making obsession! No big plans this summer. My son’s wedding is coming up in September. Love this thread collections. Thanks for the giveaway. What beautiful colors! We plan on beaching it in SC and doing a cruise to the Bahamas in August. Cannot wait! These are beautiful! We are hosting college friends of our oldest & touring colleges with our youngest….a few sewing days tucked in as time permits. Thanks for the opportunity to win this beautiful collection. The colors are wonderful, like the colors of my garden flowers! Looking forward to a few quiet times sitting on my new shady patio stitching. Such cheery colors !!! My summer plans include sewing baby quilts and teddy bear pillows. Love all the thread colors! Such happy colors! We just returned from a river cruise in Europe and had a wonderful time. Looking forward to having lots of sewing days during the summer! the thread set colours are beautiful !! I’ma gonna need some too, to go with your fabrics when they come out ! We will be hosting friends and family all summer long on our farm – people come to us since we live in the country ! Right now our agriculture intern from 5 years ago is visiting from his home in France – it’s like one of my children has come home :))) Thanks for the chance to win ! Whoo Hooo!! Love the thread. I plan to go to the Iowa State Fair in August. This is a yearly trip with the highlight being the Fabric and Threads exhibit. Especially the quilts. So much talent and inspiration. All my favourite colours. They make me smile! We are doing day trips closer to home this summer. Lot’s of fun adventures are planned. Such great colors. We have some long weekends to see our grands and maybe a trip in the fall for cooler weather and fall color. I made my first quilt two years ago, then in 2015 we spent the year in Durham NC where my husband had a lung transplant . We are back home in Tennessee and I’m so looking forward to spending time in my sewing room . I love bright happy colors and would love to have this collection of thread. These colors and prints are perfectly adorbs!!! We just finished our summer adventure–a road trip to Cali. Now it’s time for summer quilting!!! Love the colors – no travel plans till the fall so my summer plan is to catch up on some sewing on the hot steamy days. I’ve been busy teaching but now that school is out I have cleared the decks for some serious sewing. These colors are an inspiration! Just weekends at home until we head to NC beach in August. Love the thread colors! Such pretty colors! Just got back from celebrating my parents’ 50th wedding anniversary. Plan to hang out with my boys as much as possible this summer! Gorgeous threads! We just finished one cousins camp with 5 grandchildren (3 who are nine and 2 who are 7) and getting ready for another with two are 5! There are two more who are still too small! Whew! We have spent the year (almost done)making great memories for our son’s 10th year of life! Love the new thread! Perfect for so many projects! This summer we are prearing our youngest to go to collage and planning on selling our house and relocating for my husband’s job! I LOVE your new fabric line! DH and I are going to a B@B for 5 nights on a private island on Battle Lake Mn with canoes and kayaks and paddle boards and wonderful swimming in a clean clear lake. Then we’ll stop at a few quilt shops for the Quilt MN Shop Hop and do some golfing on the way home. Beautiful fabric and the matching Aurafil thread. Wow! Three colors of aqua blue! No summer plans but have a Vegas get away planned for fall. Thanks for hosting such a great give away. Those colors are absolutely yummy! Our big plans this summer is my niece’s wedding ❤️ So excited for this, especially because my kids are coming home for it so it will be once of those rare occasions that everyone is in the same place at the same time! These thread colors are so versatile, and are perfect with the Dixie fabrics! Your new line is so bright and cheerful! I’m planning a week in Virginia Beach before school starts with my kids and grandkids. Summer plans are to visit family in North Dakota, and to get a lot of sewing done! Thank you for the chance to win those beautiful colors! Those threads look so yummy! We’ll be spending time at Lake Michigan! The thread collection is divine. We’re staying close to home this summer. Lots of quilting going on here. Thanks. I do have a plan to visit my son, his wife, AND my granddaughter this month in Dallas! Besides that I am spending lots of time in my workshop; sewing and lesson planning for my 6 students to whom I teach sewing and crafts. I love love love working with Aurifil but it is hard for me to find where I live. These colors with your fabric are calling my name…thanks for the giveaway. Such beautiful fabric! No plans to go anywhere as will have family coming here! Enjoy your summer! It’s winter… hoping for snow! I’m interested to know what others do, I’ve always matched thread colours to fabric but my neighbour a quilting teacher says always use light grey for everything. My summer plans are to sew three skirts. Not usually a garment sewer, so this should be interesting! Your thread and fabric are happy and beautiful colors of summer. I plan to enjoy my twin granddaughters, just home from the hospital. The thread colors are lovely. Pretty thread and pretty fabric! I’m spending a few long weekends camping with daughter and grandkids. What fun happy delightful colors, would be sew much fun to get to play! thanks for chance and will buy when they are in local quilty shop. Such gorgeous colours! Aurafil is my favourite thread! Beautiful colors, and I love the fabric! My summer plans include day trips with my 8 year old nephew, improving my baking skills, and maybe finding a job. I plan to spend lazy afternoons playing in my craft room. I love your fabric collections and I love the coordinating threads. Beautiful fabric and thread! My big, fun summer plans have already come and gone. The rest of my summer will be spent on some serious quilt making – which will be a lot of fun too!. Other than that, Hubs and I may try to sneak off for a beach weekend later in the summer. Love the gorgeous happy colors. Summer is for relaxing, and we do have a lot of family visiting. We wait until fall to travel. I love the fabric and the thread! Very nice variegated too :) Our summer plans are to enjoy the warm weather! May also grab a trip to make it last a little longer. Love the fabrics and thread colors! Love the colors. We are planning to spend a week on the Maine coast and I get to bring my machine to sew and watch the beautiful scenery. What lovely colours! Would love to win those :-). We are going to Holland in 10 days for a three week vacation! Looking forward to that. New inspiration for quilting :-). Beautiful colors! I just finished making a “To the Point” throw quilt for a friend, and I love it! Thank you for the excellent pattern plus the finishing ideas here on your blog! We’re heading to the mountains of North Carolina with our youngest four children for a few days. We’ll be doing some whitewater rafting and hiking! Love all the colors of thread! I have planned a trip to the beach at Myrtle Beach in South Carolina for a week of peacefulness and relaxation with family! Those colors do look gorgeous all together! We’ll be spending a week at Lake Okoboji in IA!! We go to Alaska every other year to see family, so that is our plan this summer. Should be fun! Our son got married in June to a wonderful young woman. Three days later, another son graduated from the Fire Academy and won the Most Valuable Cadet award. Joyful celebrations for our family. Love the colors of these fabrics and thread- happy colors! thanks for the chance! I love the colors of the thread and fabric! This summer I am having a great time teaching young (and some not so young) girls to sew! I love to pass this skill on and am doubly blessed because a couple of these girls are my cousin’s granddaughters!!! My plan is to find a week with no obligations and stay at home. Ideally with all devices off, a stack of books and a couple of quilts a cut out and ready to sew. Oh and pizza/meals delivered. My fun summer plans includes welcoming our new grandson in about 2 weeks! Would love to win this beautiful thread box!! I don’t think I have ever seen fabric and thread match so well. Great job. Going to see my kids who have moved from Texas to Seattle ! I miss them dearly! Gorgeous colors for gorgeous fabric. Summer plans–cleaning out a house and moving in. We’re halfway there! I am in love with your Dixie fabric line. The Aurifil thread is the perfect compliment!! Love the colors! My plan for the summer is to finish out our vacation at the beach and then make a bunch of quilts when I get back home. What beautiful threads! I can’t wait to get my hands on Dixie. Such pretty colors. Wonderful summer colors. It is winter where I am. I am making an eye spy quilt at present. WOW ! Love the fabrics and thread colors. How exciting to have them match perfectly. We have no further summer plans. Just to stay cool. Then, a nice fall trip to Santa Fe, NM. Thanks for offering this great give away ! Love everything you do. We’ve been following grandsons’ baseball and summer basketball games. Maybe a trip later in the summer or early fall. Thanks for the opportunity to win some gorgeous threads. I am a new convert to aurifil threads. This would expand my selection. No one near me carries this thread and it’s hard to choose colors online. Beautiful colours! Hoping to get to Vancouver myself this summer! I have never sewn with Aurifil but have always wanted to indulge. They really are beautiful threads. Those thread colors? Perfect! Shiny and bright, just like your fabrics. And I love using Aurifil. Beautiful colors!!! Summer plans: Road trip!!! Amazingly lovely colors! A short trio east to NY to visit family, early morning walks on the trail and weekends with the grands will fill up my summer. What lovely, bright, clear colors! I love your fabrics! Hazel is one of my all time favorites! My daughter and family just named their puppy Dixie. Our summer plans were…we just got home from Alaska late last night. Visiting our son and his family. No other plans, unless a quit couple days at the beach. Love those colors! I’ve already traveled this summer, spent a fun week in Florida. Planning to relax at home (in between work for the rest of the summer ). What a luscious set of threads and fabrics – I can’t wait to see them in person! Our summer fun has already happened. Both families came up for their last visit “north”. We have the house up for sale and are packing and sorting for a move in early fall. Sad time for us but beautiful memories. no plans…just surviving! cant wait to see more baby pics and love your new dixie line and thread! Such pretty colors! Plans for the summer include getting away from Texas heat and going to the northern California coast. Awww…..I can smell that fresh ocean breeze. Those colors are beautiful!! Our only summer plans are to go to our farm about an hour away every opportunity we have & we are going to plan a trip to Branson for a few days soon before our daughter goes back to school! Love the beautiful colors! We are planning a Schlitterbahn trip–fun experience! No plans except to enjoy our Oregon summer with fires on the patio with friends, food and family. Your thread collection is beautiful! Beautiful colors! Sewing all summer long! The fabric and thread are beautiful! We are heading to Sandpoint, Idaho for 10 days to relax and boat on the relaxing Ponderay River. Those thread colors are so beautiful together. Why not travel to Victoria? The ferry ride is so fun for kids. Lots of splash pads for little ones, hikes, lakes. Of course, Vancouver is beautiful too. You can’t go wrong in BC. Threads are beautiful. Would be perfect for topstitching bibs. Charity sewing this weekend. I see a few prints I will HAVE to have! No particular summer plans, but will be traveling up the coast (Pacific side) this fall. Planning to drive to Eastern Canada in the Fall, but will stay around home this summer. Always enjoy your blog! our tastes are similar. i am going to my daughter’s in austin and we are going to hop the row by row quilt shops in her area and then am going to the san antonio area and row with a friend. shop, shop, shop. No special plans here-just hanging with family and sewing when I get the chance. Gorgeous colors! LOVE these fabrics and of course, Aurifil threads are the best and the only thread to use and these colours are fabulous. I am back and forth to Vancouver Island because of family and aging parents but love ‘going home’ to Victoria. We winter in Arizona so am quite content to be here at home in the Pacific Northwest. Hello we will be renting a beach house for a couple of days! And just hanging out at the house swimming and eating! Love those thread colors! LOVE these fabrics and the threads that match! AWESOME!! Love your fabrics. The threads are perfectly matched to your fabric! Beautiful.!! My summer plans are spending time with our grandchildren, quilting, and sewing, putting up pickles from the garden. I am swooning over those colors! They are so pretty that they can’t be hidden in a drawer, they need to be displayed on my shelf so that the sweet colors can be my eye candy. Our plans include camping and local kid friendly destinations. It’s summer in Texas so the plans include only going outside to play in the pool and staying inside working on a kitchen remodel! to start adding more than a few to my collection!! We are planning a trip to Hood Canal in August. Looking forward to fresh oysters and lots of water time! Sure love the fabric collection & the beautiful threads to match. Planning on being able to see all 6 of my children & their families (12 adults & 15 grand kids + me & my husband) this weekend for a reunion in San Diego! 14 kids 9 & under make for lots of fun memories. It’s so fun seeing the grand kids reunite. Also looking forward to a quilt retreat in orlando, fl next month with friends who are spread out all over the states. Trying to decide on projects to bring! Love the beautiful thread colors. I’m in Alaska to fish for salmon and hope to fill the freezer. I brought some quilt projects along for rainy days like today! Thank you for your blog! The thread colors are so beautiful–just like Dixie. I am busy healing and recovering this summer. I appreciate any prayers support. Allison, I love your fabric designs because the colors make me so happy! Our summer is filled with around-the-house “chores”: quilting, feeding the deer, quilting, gardening, quilting, playing with the cats. Did I mention quilting??? My summer plans is to attend as many baseball games of grandson and softball for granddaughter as possible. Our baseball team is hoping to go to State again this year- last year was the first time! I am also quilting up UFO when I get a few free minutes. Beautiful thread colors! No big vacation plans although a few day trips planned with my quilting sisters. Quilt shows and quilt retreat. Since I am fat and pregnant, my plan is to stay in the A/C! All the while sewing up little girl stuff, because let’s face it, girls are way more fun than boys to sew for! My plans are getting prepared for my daughters wedding in early September. I am making burlap table runners with lace accents and many other items to save money and just because I love to do it. It’s a country wedding by a pond and the reception in a barn. I am so excited and a bit nervous that we aren’t forgetting anything. Love the new fabrics and thread!!!! Your baby is beautiful! Congrats! Love the new fabric and threads! My plans this summer is spending time with family! I’m such a fan! Keep on enjoying that baby! Beautiful! Eye candy! Love the colors! Keep on doing what makes you happy, it shows in your work! Love your Aurifil thread collection! We are planning to go to a Bible Conference next week. Then we do not have any real set plans, except to take out our 1960 MGA that my husband restored and check out the countryside. Always new places and roads to find. Love your new fabrics and the thread to match. Going to be making a baby quilt soon and thinking these would be perfect! Last weekend my hubby and I spent our first kid free weekend in 8 years. It was divine! We slept in, stayed up late, shopped without anyone asking to buy a treat at the checkout. It was divine! This new line looks tempting! Summer plans? Low key, but maybe a weekend in Elkhart Lake, WI for the Historic Races. Your fabrics and threads are fabulous!! I’m planning some garden shed and deck projects for this summer so will be busy around home. Beautiful colors! My summer plans are packing and moving…..not sure if that is fun or not, but will try to make it fun. Lovely! Tomorrow my son, mother, and I are going to join my aunt at her beach house in Chincoteague where we will hopefully have some beach fun and see some wild ponies! Oh, those colors!!!! When I look at my stash I would say they fit right in :) Love the Dixie fabric line. We have a staycation planned this summer. This week we have grandchildren staying with us from different families. The cousins are having a great time together. I go back to work next week but on Saturday I will be headed to The Sisters outdoor quilt show. Our daughter has a quilt hanging there this year. What I am suppose to be doing this week is going thru stuff and downsizing. We have not moved in over 40 years and would like to clear stuff out so when the time comes it will be easier – however playing with the grandkids is more fun. Aurifil thread is like candy for the quilter! Such pretty colors. My fun family trip is going to the Maine coast in September! Can’t wait. What beautiful Colors! Our plans for this summer are to stay home and have everyone visit us! We are done with vacation, and staying home until school starts, thank goodness :) Such pretty thread! My daughter and grandsons are coming to visit. That’s good enough for me. I would say this beautiful thread and fabric is hugely popular judging by how many responses there are here – wow!! I am also just staying home this summer with a few weekends at Six Flags to play. Stitching and learning about stitching – pure heaven!! Have a terrific summer everyone! !